The National Association of REALTORS® (NAR) reports that the Pending Home Sales Index fell 4.3 percent in December as compared to the month prior. The index now reads 101.7. The Pending Home Sales Index measures the number of U.S. homes that have gone “into contract”, but have not yet closed. The report is based on data collected from local real estate associations, and from national brokers. 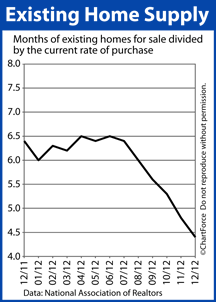 Despite December’s drop, however, the annual rate at which contracts for a home purchase were drawn increased 6.9 percent from one year ago, and marked the 20th consecutive month of annual purchase contract gains. NAR reports that 80% of homes under contract are closed with 60 days, with the majority of the remained homes “sold” within months 3 and 4. Analysts believe that December’s Pending Home Sales Index drop is not a result of a weakening housing market. Rather, it’s a function of a falling national home supply; in particular, a shortage of homes in the West Region offered a prices under $100,000. Although December’s Pending Home Sales Index dropped as compared to November, the year-to-year growth of pending home sales suggests a broader improvement in the U.S. housing market. Furthermore, the index is a strong indicator of existing home sales, which means that this season’s home sales should outpace those from 2012. 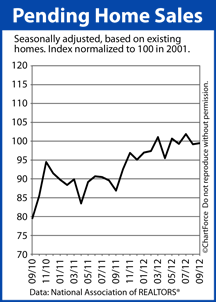 The Pending Home Sales Index is bench-marked to 100, the value from 2001, which was the index’s first year of existence. 2001 was considered a strong year for the housing market so last month’s 101.7 is considered a positive measure for the housing market. Analysts project a strong Spring market in South Orange County and nationwide. Home buyers continue to push the U.S. housing market forward. 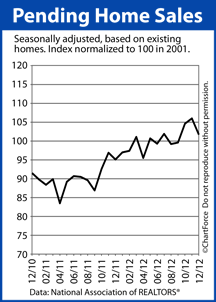 The Pending Home Sales Index (PHSI) is published monthly by the National Association of REALTORS®. It tracks homes under contract to sell, but not sold. The PHSI is relative index, comparing current contract activity to the activity of 2001 — the first year for which “pending homes” were tallied for an index. 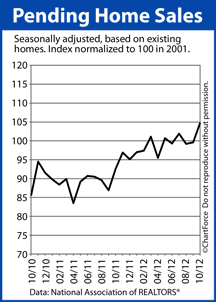 The Pending Home Sales Index has posted an average score of 100.2 from January 2012 through November 2012, the most recent month for which there’s data. This is a significant data point because it means that the 2012 housing market is performing better than the 2001 housing market; one which is widely considered a strong one for housing. It’s also meaningful because it foreshadows a strong market for 2013. With an increasing number of homes under contract to sell, it can be assumed that “closed units” will increase in the future, too. The National Association of REALTORS® says that 80% of U.S. homes under contract go to closing within 60 days, and that many of the remaining homes go to closing within days 61-120. The monthly Pending Home Sales Index, therefore, can foreshadow to today’s buyers and sellers what’s ahead for the housing market. The Pending Home Sales Index is a forward-looking indicator. 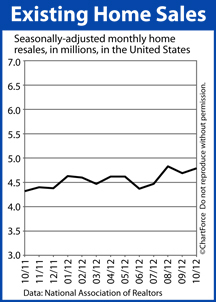 Based on November Pending Home Sales Index, we should expect to the home resale market to remain strong, and to pick up strength, through the first quarter of 2013. 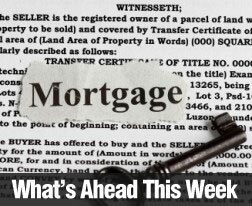 Demand for homes is high, mortgage rates are low, and buyers are looking to get a good deal. 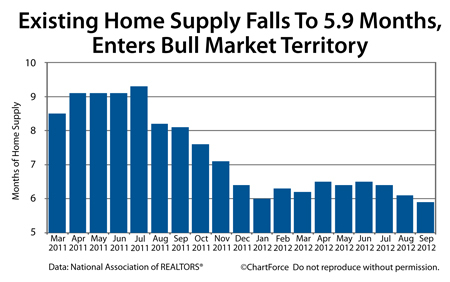 The first few months of the year are often thought to be “slow” for the housing market. This year, however, that may not be the situation. If you’re actively looking for homes in South Orange County , the best prices may be the ones you get this winter. The housing market in South Orange County is poised to end 2012 with strength. 2013 is expected to begin the same way. The real estate trade association tell us that 80% of U.S. homes under contract go to closing within 60 days, and many of the rest go within Months 3 and 4. In this way, the monthly Pending Home Sales Index can foreshadow to today’s South Orange County home buyers and sellers what’s next for housing. For today’s South Orange County home buyers, the August Pending Home Sales Index is relevant for several reasons.